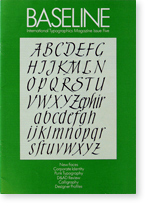 Welcome to the fifth edition of Baseline – Letraset’s magazine of type and type design. Licencing our faces for other systems means designers and typographers have even greater choice and flexibility; they can use Letraset exclusive faces on dry transfer as well as being able to obtain them from their local typeshop. And new, quality faces continue to be produced as shown in this issue. We are living in interesting typographical times and both Letraset and Baseline magazine will continue to bring you the latest and the best in type. 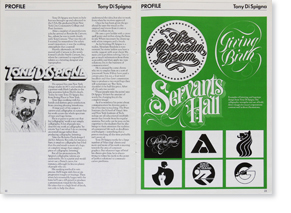 Tony Di Spigna was born in Italy but was brought up and educated in the USA. He graduated from New York City Community College and Pratt Institute. 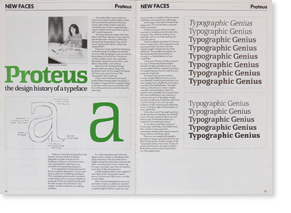 Proteus is a new face designed by Freda Sack for Letraset. Freda has already designed a number of faces such as Paddington, Talisman and Victorian and is also responsible for many faces now available from typesetting companies.